Crossing is a collage of found images made after a collision at a crossroads on the outskirts of Pretoria. Situated between a fast-expanding informal settlement on one side and a formal, government housing settlement on the other, these crossroads are not regulated by traffic signs or lights. I came across these fractured chairs scattered arbitrarily on the roadside. The scene reminded me of an archaeological site in that the shattered, dismembered chairs scattered across the landscape recall skeletal remains that provide evidence of human existence. This scenario is even more evocative since six people have died here due to the authorities’ failure to safeguard this dangerous crossing. This event and the subsequent photographs thereof had a significant impact on me. Later in America, in upstate New York during my residency at Art Omi, I decided to take this idea further. After having made and sold some ink drawings based on the photographs, I collected enough money to purchase a number of plastic chairs identical to those I had seen at the crossroads. In an attempt to duplicate the scene of the accident, I and a few fellow artists and critics (some pacifists refused to participate, while others like Kirsty Tinkler, Olu Oguibe and Rubén Gutiérrez jumped at the opportunity to expend some testosterone) manually smashed the chairs. This enactment added another level to the happening, raising the question of whether art, and the expense implicit in the creation thereof, can be justified in the face of social deprivation and poverty. Re-enacting a South African event brought this issue to the fore, as the price of a plastic chair (bought for the sole purpose of breaking it in the name of art) may equal the weekly income of an unemployed South African living below the bread line. It was in a spirit of self-conscious irony that this boisterous enactment took place. A further irony transpired in that during the controlled re-enactment of an accident, another kind of accident occurred, namely that I sustained an injury to the head caused by a plastic projectile of my own making. In Mexico, a few weeks later, Rubén Gutiérrez and myself drove out into the desert, which resembles parts of the South African landscape. 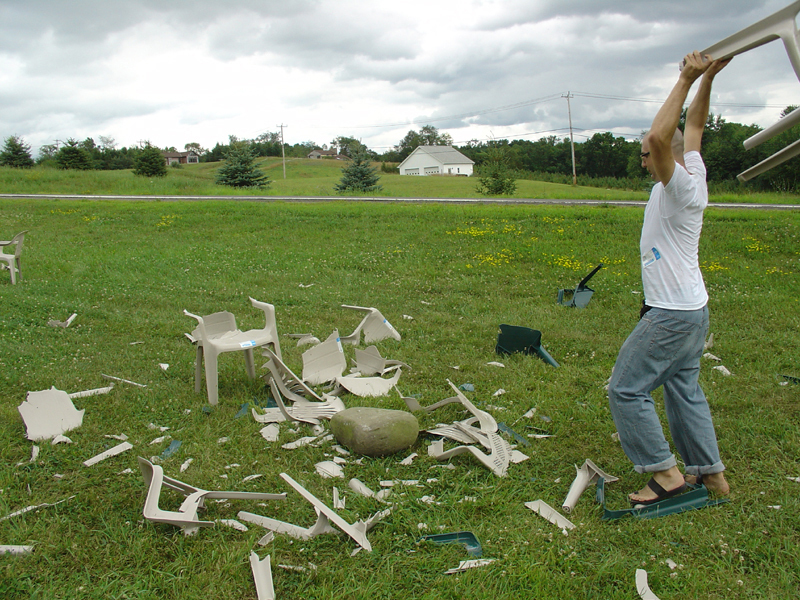 There I continued the tradition, this time only smashing one chair, which, in this particular context, was all that was required. The theme of the Mexican show was the "residue of actions". And so the remains of the smashed chair were mounted haphazardly (unplanned) and installed.